The ultimate aim of any tissue paper machine is to produce a lightweight sheet of paper that is soft, absorbent and strong enough to fulfill the functions needed, and which can then be converted into finished products which will be accepted by consumers and buyers in the marketplace. These products may include items such as bathroom tissue, paper kitchen towels, facial tissue, handkerchiefs, commercial and industrial wipers and sometimes even items such as medical disposable wraps and garmets. To create this sheet, tissue machines thus designed to evenly distribute a suspension of wood fibers in water into a very thin layer, and then to remove most of the water. The suspension of wood fibers and water, called ‘stock’, usually has an initial composition of around 99.5% water and 0.5% solids, mostly fibers. Finished basis weights of tissue are typically in the range of 13-25 grams/square meter (gsm). The sheet-forming process involves first draining off as much of the water as possible in the forming section, then pressing it out between rolls in the press section, and finally removing the remaining water by heat and drying through the use of thermal energy. Drying is usually done via direct contact of the sheet on the hot Yankee dryer surface, as well as by impinging hot air onto the sheet in the Yankee hood. For the TAD (through-air-dried) process, which is covered on Wiki-Tissue here: TAD Basics, hot air is blown through the sheet to accomplish most of the drying. By far, the most common tissue machine concept used today is the Crescent Former, also called a Dry Crepe or conventional machine. Kimberly-Clark in the USA developed this design in the 1960s, but since the KC patent expired in 1988 many other companies have begun making and using Crescent formers. The basic layout of a Crescent former is shown in Figure 1. Figure 1. 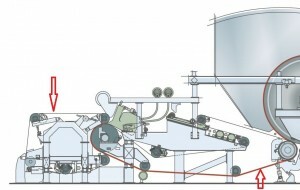 Typical Crescent Former, or Dry crepe tissue (DCT), machine configuration, with the paper sheet run shown in red. The simple Crescent former concept uses only two pieces of machine clothing: A forming fabric and a press felt, as illustrated in Figure 2. The Crescent former traps the stock between the forming fabric and a felt, avoiding the need to transfer the sheet to a felt later in the process. Before Crescent formers became widely adopted, the Twin-Wire former followed by a press felt was commonly used in the industry. In the Crescent former, a water jet containing the stock mixture of water and fibers is ejected at high speed from the headbox. The web is then formed by trapping it between the forming fabric and the felt as they wrap around a large, solid forming roll. Initial drainage takes place around this forming roll, with the wire tension determining the drainage capacity. The drainage pressure, P, is described as P=T/R, where T is wire tension and R is forming roll radius. Figure 2. The forming section, with forming fabric on left and press felt, at center and right. The most common forming roll diameter is 1.5 m. The drainage capacity provided by this diameter is sufficient for basis weights up to about 40 gsm but, at such high weights, speed is limited of about 1400 m/min. As most tissue products have a basis weight in the range 13-25 gsm, the drainage capacity is sufficient for high-speed operation up to 2200 m/min, which is essentially the fastest machine speeds achieved so far in the industry. The tissue sheet web is carried on the felt and then transferred to the Yankee in the first press nip. The first press roll is normally a suction roll which has a wide suction box of 80-110°. Over that suction zone water is removed both from the web and the felt. The web dryness is increased up to about 25% before the press nip and then typically rises to around 40% or more after the press. The linear load is typically 90-100 kN/m, which corresponds to a peak pressure of about 2.5 MPa in the nip. By adding a second press roll, the dryness can be increased by 2-4%. The second press nip, however, reduces the sheet caliper, but at the same time generally improves tensile strength. 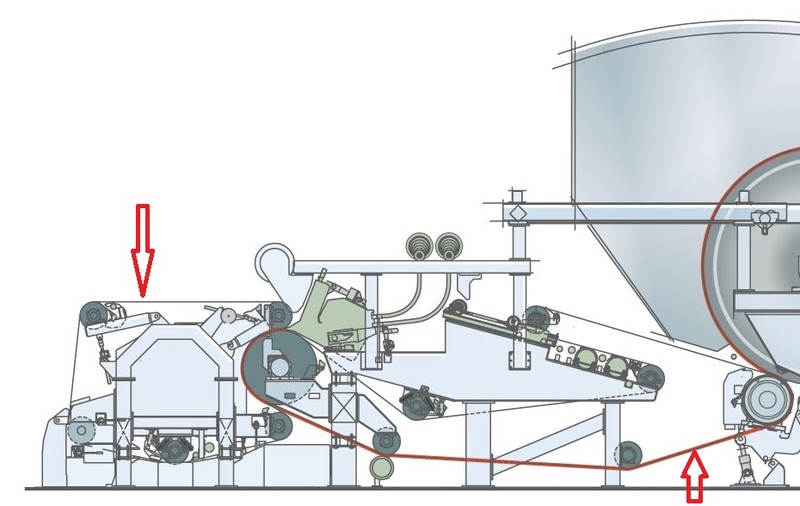 Since the hood wrap can be increased to give a longer drying zone when no second press roll is used, the production output is very similar for the two press concepts, but the single roll concept has a higher drying cost. Most tissue machines have only a suction press roll, with the main reasons being the higher bulk it offers and the lower investment cost. Occasionally, a steam shower is installed at the first press roll over its vacuum zone to heat the web and reduce the water viscosity, for improved water removal. Some steam showers also have cross-direction control zones for improving sheet moisture uniformity. In the past 10-15 years an alternative press concept has been developed which uses a shoe press against the Yankee. To reduce the water load going into the press nip, a vacuum roll is used before the shoe press roll to remove water from the felt and increase the dryness of the web. 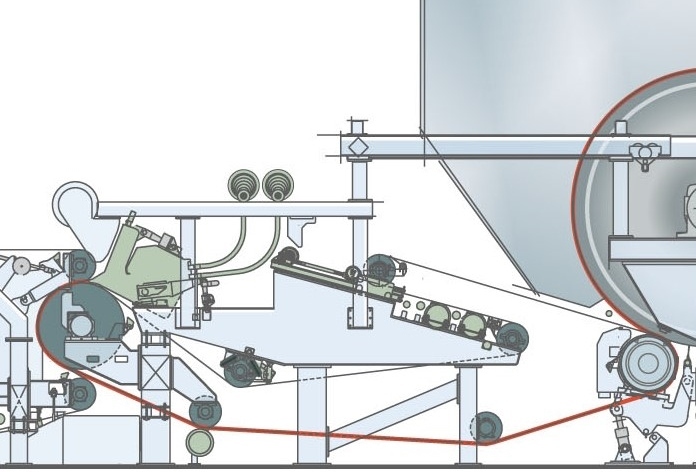 The use of a shoe press against the Yankee dryer allows the production of tissue paper with higher bulk and higher production as dryness can be increased to 46-47%. To achieve this dryness the nip load has to be increased and this usually requires a Yankee with a thicker shell to withstand the higher pressure. During the last 10 years there has been a lot of focus on energy consumption. The shoe press is one new solution which reduces energy consumption. Other innovations that save energy on tissue machines are the steam generator, improved headbox design, turbines in the forming section, insulation of Yankee heads, etc. It is today possible to run a tissue production line using less than 2,000 kWh/ton, which can be compared to 2,850 kWh/ton in 2006. Figure 3: An example of a shoe press configuration. – To provide the base for the creping process. The drying capacity of a tissue machine is mainly affected by the size of the Yankee dryer. Over the past 50 years, the operating speed on tissue machines has increased with the development of twin-wire formers and then the Crescent former. The need for higher drying capacity resulted in bigger Yankee dryers being built to handle the drying requirements. Today, the fastest tissue machines have Yankee dryer cylinders with a diameter of 6 m or more. In addition to the Yankee dryer, a high-velocity impingement hood blows hot air with temperatures above 500C onto the sheet to increase the rate of drying. 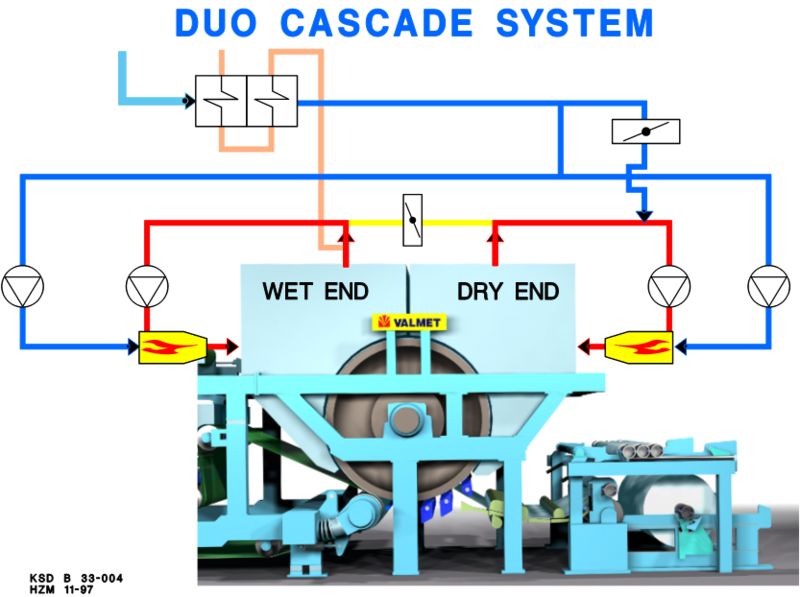 The most common air hood system is called the “Duo Cascade System”, Figure 4. Each hood half, the wet-end and the dry-end hood, has a recirculation fan and a burner. The exhaust air is taken from the wet-end hood as it has higher air-moisture content. There is a connection between the systems via a damper, so that air from the dry end hood can be taken to the wet end hood. 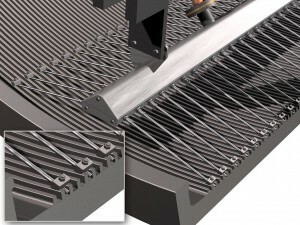 A heat exchanger in the exhaust line heats the ingoing air, which is mainly used for the gas burners. In addition to the heat exchanger, there is typically a system with a wet scrubber to heat water, which can then either be used for process water or heating the buildings in the tissue mill. Conductive drying starts at the first press roll nip and continues as long as the sheet remains in contact with the dryer surface. Convective and radiant drying begins under the area covered by the Yankee hood. 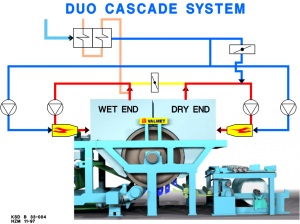 The Yankee drying process is a very intense one with drying rates of 150-240 kg H2O/h/m2 versus 20-30 kg H2O/h/m2 on a conventional “can” drying section on a normal paper machine. During drying, the sheet is fixed on the dryer and not subjected to edge shrinkage as in other drying sections. This also means no open draws exist on the tissue machine until the sheet is dry and creped off from the Yankee dryer just before the reel. The Yankee dryer is grooved on the inside to achieve an efficient heat transfer when steam condenses, as shown in Figure 5. The condensate builds up in the bottom of the groove. This means that heat transfer is mainly at the walls of the groove, which gives a very efficient heat transfer. It also means that a Yankee with deeper grooves has higher energy transfer through the shell. Straw pipes in the grooves remove the condensate. The Yankee dryer has been made of cast iron since as long as tissue machines have been in operation, going back over 150 years. The cast iron cylinder is ground to a certain roughness, and the material has continuously been improved to improve heat transfer. The final quality of the tissue, and especially the softness, is greatly dependent on the creping. Creping gives the paper higher bulk and improves softness, absorbency, and stretch. It also reduces the tensile strength. Most tissue is creped at 93-97% dryness levels. Tissue machines normally have three doctors of which the creping doctor is the middle one. Before the creping doctor, a cut-off or skinning doctor is installed and is in use only when the creping doctor blade is being changed. After the creping doctor blade, a cleaning doctor is often used in the last position to remove fiber and excessive coating. 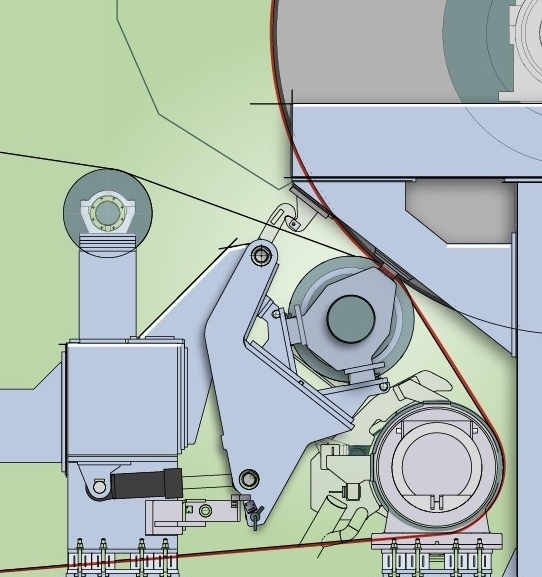 The dry end of the tissue machine has a reel for winding the tissue sheet. As mentioned, the reel runs at lower speed compared to the Yankee dryer, because creping shortens the sheet. The speed difference can be in the range 10-25%. This speed difference is called crepe ratio and is defined as [1-(reel speed/Yankee speed)]x100%. Toilet tissue is normally produced at 17-20% crepe ratio while kitchen towel is in the range 15-18%. The creping process increases the bulk by about 100%, but it reduces the tensile strength with almost 50%. Typical bulk is in the range 8-9 cm3/g for the best products. The Yankee side of the base sheet is softer compared to the hood side. In the converting process where the finished products are made, the Yankee side is placed as the outside in a 2-ply product to get the highest product softness. 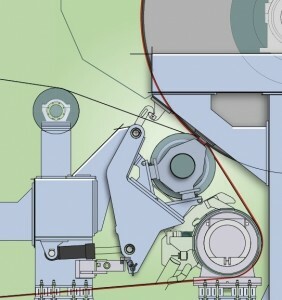 Some tissue machines have a calender before the reel which is used to improve surface softness and reduce CD caliper variation in the sheet on the reel. The calender is used when producing facial tissue or high-quality toilet tissue. At high-machine speed operation, it is necessary to use active foils to support the sheet through the dry end.